It was January 1918, while World War I was still in full effect, the Bolsheviks had already seized power in Russia for a few months. It was no longer in the new Russian interest to continue its military campaign in the Caucasus Front in partnership with the Armenians. The new move to withdraw Russian troops caught the Armenian leadership in Transcaucasia off-guard. The decision would remove the only force capable of protecting the Armenian population who had just experienced a genocide and deportation in the heart of the Armenian homeland at the hand of the Ottomans, where 1.5 million Armenians perished. At this point, the Armenians refused to accept the rule of the Bolshevik Russians, who would eventually form the Soviet Union. A decision was made to form their own military units, to defend the Armenian front as the Ottoman army was expanding its campaign eastward into Armenia. General Tovmas Nazarbekian and Drastamat Kanayan attempted to fill in the positions abandoned by the Russians and created a small Armenian army. In May 1918, the Ottoman army crossed into Eastern Armenia and attacked the modern day city of Gyumri, then called Alexandropol. The intention of the Ottomans was to crush Armenia and seize Russian Transcaucasia as well as the oil wells of Baku (currently the capital of the Republic of Azerbaijan). The Ottomans succeeded to take control over Alexondropol and began an offensive in an attempt to take over the remaining unconquered Armenian lands and moved into the heart of Armenia, Yerevan. The Ottoman offensive was viewed by Armenians as a matter of survival for the nation. If the Armenians were to lose the war, it would mean the end of the of the Armenians and their nation. The hundreds of thousands of refugees who had fled the Ottomans had nowhere else to retreat and decided to make a final stand against the Turks. So preparations were made in whatever capacity possible. Armenians from all walks of life, peasants, poets, blacksmiths and even clergymen organized and formed military units. Civilians including children, aided in the effort as well, as “carts drawn by oxen, water buffalo, and cows jammed the roads bringing food, provisions, ammunition, and volunteers from the vicinity” of Yerevan. On May 21, the detachment of Zihni Bey defeated an Armenian unit composed of 600 infantry and 250 cavalry, and then took Sardarabad. From there, their forces started advancing toward Yeghegnut. On May 22, the Armenians launched an offensive ordered by General Movses Silikyan and led by Poghos Bek-Pirumyan, a reserve guerrilla unit called the 5th Armenian Regiment, and a special cavalry regiment succeeded in stopping the Ottomans in their tracks and forcing them to retreat nearly 15 to 20 kilometers westward. 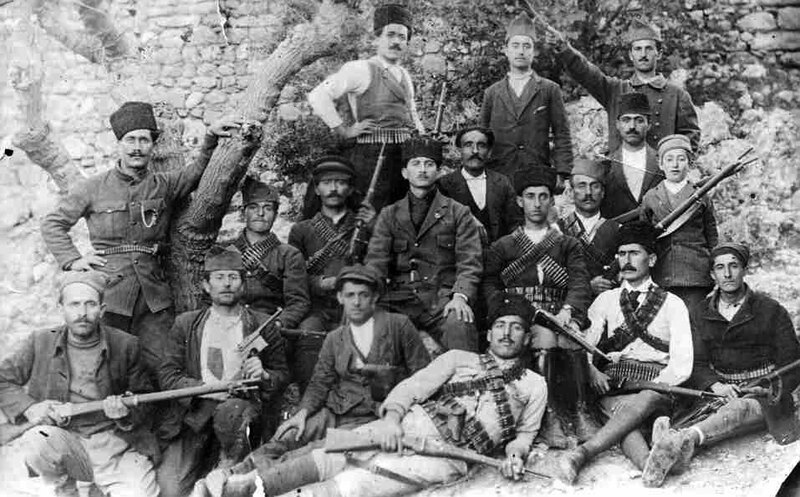 After reorganizing the Ottomans attempted to cross the Araks River but were met with fierce resistance by the 5th Armenians Regiment. On May 27, an Armenian force commanded by Colonel Karapet Hasan-Pashayan performed a flanking maneuver and struck the Ottoman positions from the rear while the rest of the Armenian forces pounded the main Ottoman positions. An Ottoman force based in Talin was sent to alleviate it by attacking the Armenian rear but was unable to change the outcome of the battle. Suffering heavy losses, Ottoman commanders ordered a general retreat as the surviving elements of the Ottoman army were put to flight. Thanks to Armenian victories against the Ottoman army at Sardarabad, Bash Abaran, and Karakilisa, prevented the annihilation of the Armenian nation, as the victories here were instrumental in allowing the Armenian National Council to declare the independence of the First Republic of Armenia on May 30 – retroactive to May 28. Though the terms that Armenia agreed to in the Treaty of Batum (June 4, 1918) were excessively harsh, the little Republic was able to hold out until the Ottomans were forced to withdraw from the region with the end of World War I in late 1918. Members of the Second Cabinet, October 1, 1919. Left to right: A. Sahakian, Alexander Khatissian, General C. Araratian, Nikol Aghbalian, A. Gulkandanian, S. Araradian. The significance of the battle of Sardarapat is great… If they [the Armenian forces] did not defeat the Ottomans there, they would have proceeded to Echmiadzin and Yerevan—nothing would have remained of Armenia, nothing would have been saved… The Armenians won and, thanks to them, our people preserved their physical existence within the current borders of Armenia. Walker, Christopher J. (1990). Armenia The Survival of a Nation, 2nd ed. New York: St. Martin’s Press. pp. 254–255. ISBN 0-7099-0210-7. Balakian, Peter (2003). The Burning Tigris: The Armenian Genocide and America’s Response. New York: HarperCollins. p. 321. ISBN 0-06-055870-9. Poidebard, Antoine. “Rôle militaire des Arméniens sur le front du Caucase après la defection de l’armée russe (décembre 1917-novembre 1918).” Revue des Études Arméniennes 1, pt. 2 (1920): pp. 143-161. Turkish Military Operations in the Caucasus after the 1917 Russian Revolution: The battles of Serdarabad and its Political Results. Ermeni Araştırmaları, No. 25, 2007. The Turkish Campaign on the Caucasus Front during the First World War: The Operations of the 3rd Army, T.C. Genelkurmay Başkanlığı Basım Evi, 1993, p. 516. Harutunyan, Ashot H. «Սարդարապատի ճակատամարտ 1918» [The Battle of Sardarapat, 1918]. Armenian Soviet Encyclopedia. Yerevan: Armenian Academy of Sciences, 1984, vol. x.
Mnatsakanyan, Aramayis N. (1978). Մարշալ Բաղրամյան, Կյանքի և Գործունեության Ուրվագիծ [Marshal Baghramyan: An Outline of His Life and Work] (in Armenian). Yerevan: Hayastan Publishing. p. 32.